Again in April 2011, Amir Ben Dov visited two important sites near his home to monitor the gulls that are present at Ashdod and Maagan Michael fish ponds. By April, all adult southern breeding taxa have left for the breeding colonies of course, leaving the immature birds to start for the complete moult. Adult fuscus and heuglini can still be present at the very start of the month, but adults of these taxa as well continue their journey to the tundra to occupy breeding territories. Armenian Gull (armeniucus): about 300 birds present, all 2cy birds, except for one adult and about 5-10 3cy birds). The 2cy birds start to get very pale, whitish pale-brown flight feathers, which are very worn and abraded. The condition of the feathers (especially retained juvenile feathers) deteriorates quickly now with rising temperatures and it will get worse in June and July. 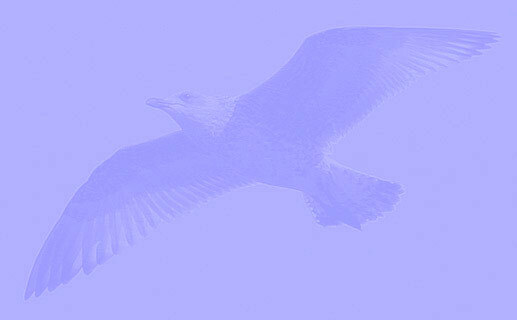 Now, mid-April, the complete moult has commenced in armenicus and many birds are seen with P1 missing or P1-P2 missing. No more than only 60 gulls are present today, and most (40 birds) are nominate Lesser Black-backed Gulls (fuscus) with another 10 heuglini. One interesting bird showed characteristics of the taxon Steppe Gull (barabensis) and a few 2cy Armenian Gulls (armenicus) were there as well. Larus armenicus adult April 01 2011, Ashdod, Israel. Picture: Amir Ben Dov. Larus armenicus adult April 02 2011, Ashdod, Israel. Picture: Amir Ben Dov. Larus group, April 26 2013, Pigeons Island - Maagan Michael, Israel. Picture: Amir Ben Dov. Larus group, April 26 2013, Maagan Michael shore, Israel. Picture: Amir Ben Dov.